+219 pages with diagrams and index. Royal octavo (9 1/4" x 6 1/4") issued in white cloth with gilt lettering to spine and cover. (Betts: 39-26) 1st edition. 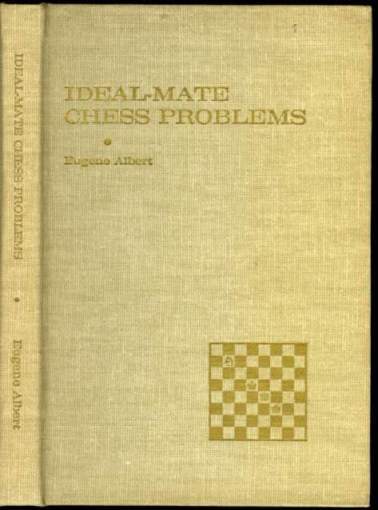 767 problems, by various composers, each leading to an Ideal-mate (defined as "a model mate in which every white man guards, king and pawns included, and every black man blocks"). Contains 140 direct mates with orthodox elements (106 diagrams) of varying lengths, 15 self-mates with orthodox elements (13 diagrams), 556 help-mates with orthodox elements (435 diagrams), 146 various heterodox types with orthodox men (105 diagrams), 143 problems with heterodox men (108 diagrams). Each is accompanied by its solution. Includes and index of composers and a glossary of heterodox terms. Lightly soiled. Very good issued without jacket.